How do I keep my naturally ahem calm and focused demeanour? I have learned to take the shortest, fastest and sometimes unorthodox path between two points. Force me on the road more travelled and I may become … well … a little less calm. I assure you the problem lies not with me – just the obstacles and detours that make me lose focus. Clearly others share this perspective otherwise I would have never heard the expression about when you’re up to your neck in alligators, it’s easy to forget your initial objective of draining the swamp. Though I suppose in that case it might serve you right for wrecking a natural habitat. But I digress. Driving down a country road last week, I visualized a dream shot potentially within my grasp. The setting sun was dusting a reddish hue over the sky with a big, fat, juicy moon near the horizon. That’s when I noticed the sandhill cranes in the field beside me. What if I could get a flight shot with the moon in the background? Wow. When my daydreaming ended, I realized I was past the cranes and quickly made a U-turn – the fastest route. I should note there are special rules for photographers in extenuating circumstances such as these. You can look it up! When I got close to the cranes, I turned off to park on a dirt approach that declined quickly into a field. As soon as I was off the main road, I realized my truck was sliding in gooshey mud. I quickly tried to turn back on the road but to no avail! I slammed the truck in four-wheel drive and succeeded only in scattering more mud. It’s surprising what forms these pesky alligators can take. In that moment, my initial objective was nowhere to be found. Much to my surprise, I somehow managed to manouver out of the muck. I breathed a huge sigh of relief and wondered what was I doing there. Oh yes. I grabbed my camera and jumped out of the truck. I moved into position just as a swoop of sandhill cranes lifted off the stubble field. I excitedly pressed the shutter and … nothing. My camera was completely lifeless despite charged batteries. There was nothing to do but watch my dream shots fly into the sunset. I packed up and headed home disappointed. I figured out later the battery pack had worked its way loose. Add another item to the list of 435 things that can go wrong with a shot. A few miles down the road, I noticed some small clouds streaking across that still good-looking moon. I decided to stop for a consolation moon shot. Just then I noticed a line of tiny sandhill cranes flying in front of the moon. I jumped out of the truck, braced my long lens against the truck frame and captured the image above. Now that was much better – quick and clean. And the photo seemed to look OK in the viewfinder. I returned home calm, relaxed and smiling. This time the alligators didn’t win! A little closer view on a “calm” day. Glad you enjoyed those colours. They seemed to grab my steering wheel to turn off the road to stop and photograph. What a great way to end the day. I LOVE your crane in front of full moon rising photo. i’ve wanted one for the longest time! i have one sort of but the moon is higher and it’s slightly blurry due to the low light. so i was nicely impressed to turn to your blog on sandhill cranes and find such a wonderful shot. thanks for sharing. i love sandhill cranes! I really appreciate that. Sandhill cranes have become a special bird to me and I thoroughly enjoy the season they share with us. The moon shot was a special bonus. I hope you get the opportunity to get exactly the shot you want. 🙂 Very well written, this post was a joy to read and look at! And good for you (and us), I’m glad you got the shot you wanted despite all the alligators. Thanks for sharing! Glad you enjoyed it. That one was fun to write once I got the idea. Keep your eye out for gators – they can find you too!! Congrats, you made some great shots! Worth all the muck in my book. Thanks. It’s funny how quickly all that fades when I get a photo I like … until I go back to tell the story of how it happened. I just love your photos, no matter how hard they are to get sometimes. Your truck almost getting stuck in mud sounds like me sometimes with my Jeep. I seem to get it places that if I get stuck, I am out of luck being the only one around. So far I always managed to get myself off and on my way. Your crane pictures are just perfect, even the tiny ones (I’ll take your word for that since they could be any old bird) against that huge, colorful moon. I was wondering if someone was going to call me on the ID of those little birds! I zoomed in until they were a blur and I saw a long neck so I’m sticking to my story! Last year I wasn’t so fortunate as you and got stuck twice though both times it was in snow. It has made me more cautious but I’d still be lost without four wheel drive. Glad you liked the photos. The avian line transverse of the moon lifts my spirit off this plane and I want to join the flight! Thanks, Lyle! Wouldn’t that be something? What a great idea. Wow what a great couple of shots – what lengths you have to go through to get “the one.” How interesting, you couldn’t of asked for a better last chance. The colors of these cranes are really beautiful. I’m a huge fan of the sandhill cranes and I was so pleased that they have given me so many chances to photograph them this fall. I need a lot of chances to get good ones. Oh man, the cranes in front of that gorgeous big moon: wonderful! And to get a second chance at it makes it even better. When I was photographing that same full moon last week I was trying my darnedest to will some of the thousands of snow geese or tundra swans that were there to fly in front of it….but they just weren’t cooperating. You have good karma! Yes I’m all for second chances willing wild creatures into a photo. I only wish it worked all the time! I wonder if there’s a course on that?? All three of the shots are stunning, Lyle, and it’s fascinating how they are all very different treatments of the same subject. The in-flight shot is hyper-realistic and you can see every feather on the crane’s body; the middle shot adds a touch of artistic beauty, with the gorgeous background; and the moon shot has a romantic sense to it that one of the other reader described as “surreal.” We don’t often get to see this softer, artistic side of you, Lyle–I like it. Your observations about the different treatments was exactly my goal – your description was most interesting. And I have to say your comment about the artistic side has got me thinking. I practice U-turn photography on a regular basis too, Lyle. Fortunately, like you, I am always on a road less traveled so there are few consequences to the habit. What an adventure. And what luck. First escaping the mud and then capturing a fantastic image. That flight shot is pretty nifty too. Happy to hear I’m in good company for seizing the moment with U-turns! The only ones I’ve regretted are the ones I didn’t take. I’m always pleased to add luck some fortuitous timing to whatever skill I have! Glad you enjoyed them. Surreal is an excellent word to describe it. And thanks for the added pressure of topping this one!! By the way, some time ago I was complaining about noisy geese and you noted that you liked that sound. Since that time I have been carefully listening to them. I have come to the conclusion there are two different sounds. The annoying one up close and the beautiful one when they are flying off in the distance. Proximity matters. I was thinking I might not be the only one tempted on the whole U-turn thing! Glad you enjoyed the post. I have been most fortunate with sandhill season this year. I’m sad to see it end. Some moments get a little frantic, don’t they? Great shots. They certain do and the thrill of being able to react quick enough to get the shot is entirely enthralling. Despite the odds, it keeps me coming back. Glad you liked these. Beautiful photos, Lyle! As expected! I appreciate that. I was hoping for some different sandhill crane shots this year and after hundreds of photos, I was able to get some. It makes it all worth it. Oh how I long for a calm day with awesome shots like these. Perfection! Damn the alligators, full speed ahead! That’s exactly the attitude I would expect from you! I hope you get that well-deserved day soon. I certainly enjoyed mine! Well that shot with the moon and flying cranes is a real beauty! They really are amazing birds and lucky you to be able to photograph them. So… blaming the alligators again huh? Well…I gotta admit, they can be troublemakers. I figured the gator reference would stir some kind of response from you! They do attract my attention in real and figurative terms. You are right, I have been so fortunate to see these incredible birds on so many occasions this fall. This may have been the last one for this year since I didn’t see them the last time out. I miss them already. 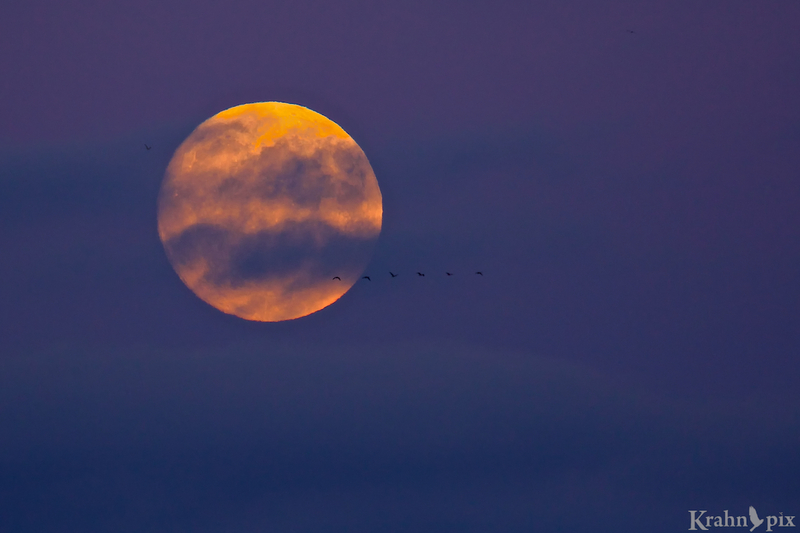 Wow, the image with the cranes flying in front of the moon is beautiful. We live in a world with incredible beauty – some moments like these are fleeting. I was thrilled to see it. Glad you enjoyed it too. Thanks. It was one of those seconds that lives on.